Smartphones may be more affordable than ever, but, for quite a few people, they are still too expensive. And they offer short battery life, pretty much across the board. It is not a winning combination, especially for those living in developing markets, looking to be connected to the Internet while on the go. Enter Nokia 215, a dirt-cheap Internet-ready phone, which Microsoft announced earlier today. It packs some of the most-important features people want in a smartphone, but without any of the major drawbacks. The software giant calls it its "most affordable Internet-ready entry-level phone yet", costing just $29. For $29, prospective buyers certainly get more value than the price-tag suggests. First off, Nokia 215 comes preinstalled with Opera Mini, a browser which is best-known for sipping on cellular data -- ideal, then, in places where Internet access is hugely expensive. It also packs Bing Search, so people can find what they are looking for easily. That said, I do wonder if and how Microsoft will change Bing to suit users in developing markets -- it is well-known that Bing is at its best in the US. Because Facebook is virtually impossible to ignore these days, Nokia 215 also offers access to the largest social network in its Messenger service. What's more, the phone supports "instant" notifications, just like a smartphone. Facebook is likely to be a stripped-down interpretation of the smartphone apps, with Microsoft only touting news feed access, and the ability to update the status and chat with friends. For those looking to communicate in 140 characters or less, there is Twitter, which Microsoft says is "easily accessible" on Nokia 215 -- whether that means through an app or Opera Mini, the software giant does not say. Oh, and there is also MSN Weather on board, with hourly and five-day forecasts. The feature that users of old Nokia phones will likely appreciate having, however, is the built-in flashlight, which can be found on the top-side of the device. Other features worth mentioning are an MP3 player and built-in FM Radio. 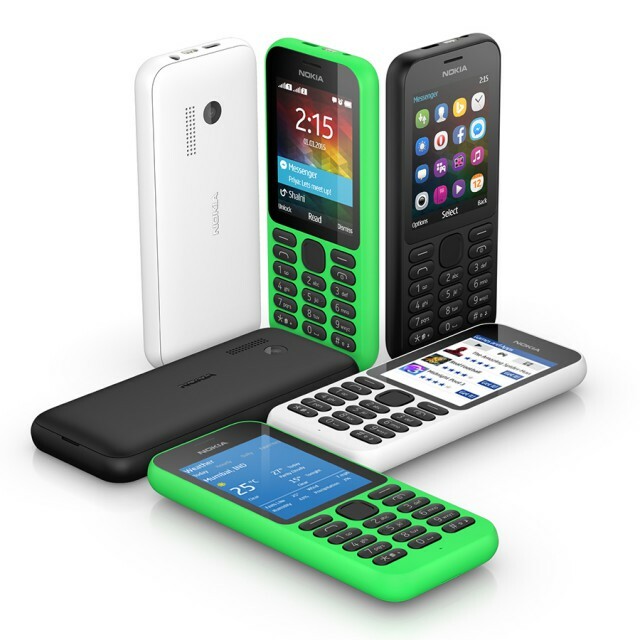 Unsurprisingly, Nokia 215 delivers great battery life (unbelievable, compared to a typical smartphone) -- Microsoft rates it at 29 days of stand-by, 20 hours of talk time, and 50 hours of music playback. There is also a dual-SIM version, which lasts less in stand-by -- just 21 days, says Microsoft. Here is what else you should know about Nokia 215. It has a 2.4-inch display, 0.3 MP camera on the back (which can shoot video), 8 MB of RAM (that is not a typo), Bluetooth 3.0, supports microSD cards of up to 32 GB in size, is compatible with 2G cellular networks (data speeds are limited to EDGE -- that means 236.8 Kbps downloads and 85.6 Kbps uploads), runs Series 30+ software, the battery is replaceable, and it features Glance screen capabilities (like Lumia Windows Phones). Since its memory is limited, the maximum number of contacts that Nokia 215 can store is 1,000. Physical dimensions are 116 x 12.9 x 50 mm and weight is 78.4 grams. Nokia 215 is set to launch in select markets, which is to be expected given its target audience, rolling out first in Q1 2015 in the Middle East, Africa, Asia, and Europe. Available colors include black, green and white.